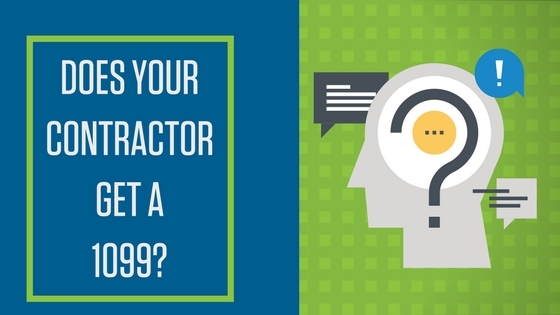 Do You Need to Issue a 1099 to your Vendors? The Form 1099-MISC, also simply called a 1099, is a tax form that the IRS uses to track miscellaneous income. Specifically, it tracks payments made to an individual or unincorporated business so that their income can be accounted for at the end of each year. There are a few different types of 1099 forms, the most common (and most likely to be used by you) is called the 1099-MISC. You might have a few vendors who you know you need to provide a 1099-MISC to, but there might be more that you don’t think of. The 2017 1099-MISC threshold is $600 per year, with the exception of payments for royalties. 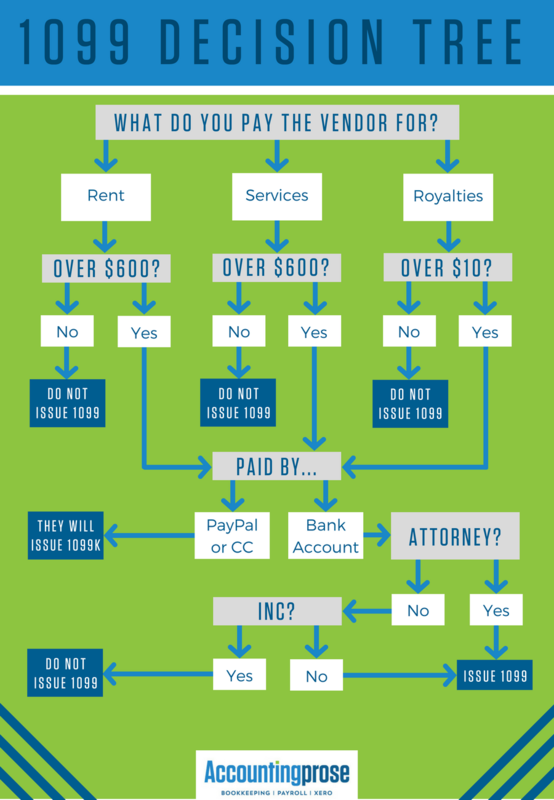 This means that if any of your vendors fall into the categories above, you don’t need to issue them a 1099 if you haven’t paid them $600 or more. If you have paid them $600 or more, keep them on the list! Next, you need to look at what kind of entity your vendor is. If your vendor is a corporation (a C Corp or an S Corp) you do not need to issue them a 1099. The exception to this rule is with paying attorneys. If your attorney has exceeded the threshold, they receive a 1099 whether they’re incorporated or not. Once you have this list of vendors figured out (even if there are still some you’re unsure of), figure out HOW you have paid them. Did you pay your vendor via check, bank draft, debit card, PayPal, or credit card? If you paid your vendor directly through your bank account (check, debit card, ACH) you are responsible for sending them a 1099. If you paid your vendor through PayPal or a Credit Card, the merchant will issue them a 1099K and you won’t have to. The easiest way to get this info is to have your vendors fill out or send you a W9. Click here for a blank W9. You will also need the amount that you paid them for the year. This can be tracked and found within your accounting software! PRO TIP: Try to get A W9 from your vendor when they first perform the work for you, rather than waiting until the end of the year to try to track them down. By collecting the W9 up front, you will already have their info on file and can easily issue their 1099 to them without having to contact them again. Once you have all of the required information, use it to fill out Form 1099-MISC. Your accounting software will be able to do this for you and print them out or turn them into a PDF to email or submit electronically. There are two copies of this form: Copy A, which you submit to the IRS, and Copy B, which you send to your vendor. Copy A of Form 1099-MISC must be submitted to the IRS by January 31, 2018. It can be submitted by mail or electronically. Once your Form 1099-MISC is complete, furnish Copy B to independent contractors no later than February 15, 2018. It’s due to them by January 31, 2018 if box 7 is filled out. If you file a physical Copy A to the IRS (mail it), you also need to complete and file Form 1096. The IRS uses Form 1096 to track every physical 1099 you are filing for the year. The deadline to file Form 1096 is January 31, 2018. Some state require you to file 1099s to them as well. Check with your CPA to make sure you’re being compliant with your state’s 1099 filing requirements. If you intentionally fail to file, you may be subject to a minimum penalty of $530 per statement, with no maximum. Need help filing 2017 1099s?